Our list of streaming partners and voice assistants just keeps growing. Some names you'll recognize right away. Others may be less familiar, but still worth exploring. Remember, availability varies by region, so click the logo to find out what’s currently playing in your area. Amazon Alexa brings convenient voice control to your Sonos Home Sound System. Beam and One allow you to start and control your music with your voice. Amazon Alexa built right in. 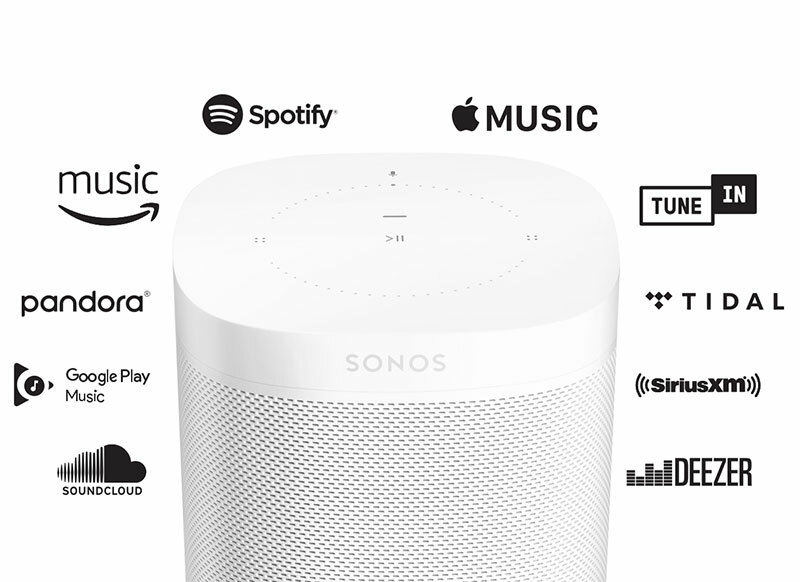 Or connect any Sonos speaker to an Amazon Echo or Dot over WiFi, and you’ve got instant, hands-free control of your favorite music and more. Free. Premium. Curated. On-demand. The list of streaming services on Sonos keeps growing. Some names you’ll recognize right away. Others may be less familiar, but still worth exploring. Remember, service availability varies by region so click for details to find out if it’s playing in your area. Already subscribe to a service? Great. 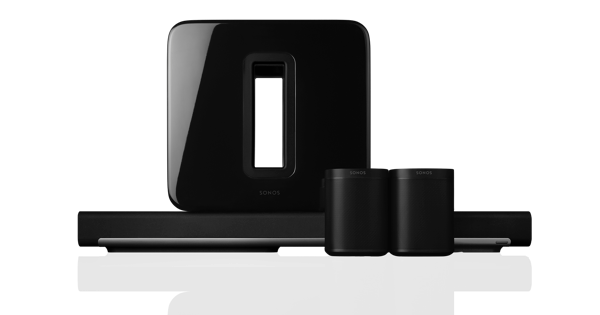 Just add it to Sonos using the app, sign in, and play it out loud – for the entire house to enjoy. Create free personalized stations from songs, artists or genres. Or browse our curated stations to find music that fits your mood. Looking for more? Subscribe to Pandora Plus and listen to your stations ad-free with unlimited skips and replays. Do you want full control? Subscribe to Pandora Premium to find the music you want, on demand. Search and play your favorite songs, albums, playlists and stations. Create playlists and use the power of Pandora to complete them. Skip and replay as much as you want with no ads. Amazon Music allows listeners to enjoy music any way they want, through exclusive offerings like Amazon Music Unlimited, Amazon MP3, the music included with their Amazon Prime membership, and more. As an Amazon Prime member, you enjoy a growing selection of over two million songs, plus playlists and stations–all delivered ad-free as part of your membership. With Amazon Music Unlimited, you’ll unlock tens of millions of additional songs along with weekly new releases, on-demand and ad-free. Google Play Music makes it easy to explore, share, store, and listen to your favorite music. Play millions of songs instantly from anywhere on any device. Get free cloud storage for up to 20,000 tracks, create custom radio stations, and enjoy smart recommendations that get smarter the more you play. Together we’ve created a whole new way to experience music. Listen to over 150 channels of SiriusXM, including commercial-free music, plus play-by-play and sports talk, world class news, comedy, exclusive entertainment and more. Plus with SiriusXM On Demand you can replay hundreds of interviews and live events, all from the comfort of your home. From Chopin to 2 Chainz, we have all your favorite music ready to stream to every room in the house. Pick from over 43 million tracks, choose a playlist to fit your mood or kick back and let Deezer Flow blend old favorites with new music recommended just for you. Meet your new music collection. It’s more than just internet radio. This is the power to play the music you love anytime, anywhere. Choose from millions of songs and entire albums to create playlists of your own or sit back and relax with Napster unRadio where we bring the music to you. Ad-free music, pure listening, That's more time to play and discover the music you want. Just sit back, relax and hit play. Music experts at your service. Our editorial team is dedicated to bringing the music to you: sample playlists from every genre, ad-free featured radio stations, new releases and perfectly curated playlists for every occasion. Listen using your Sonos, computer, or just about any device in between. It´s music where you want, when you want it. Get the free Napster app for your smartphone, tablet and, computer. Play the music you love anytime, anywhere with Napster. NTS is the world’s most authentic music platform for curated online music discovery. A global family of more than 500 musicians, artists, producers and music enthusiasts creates 24/7 radio programming with live broadcasts from London, Manchester, Los Angeles, Shanghai and remotely from events all over the world. NTS celebrates music culture and uncovers the best of the past and the present whilst cultivating the future of non-mainstream music and the scenes that surround it. With a growing international audience, nearly one million listeners are tuning in each month. 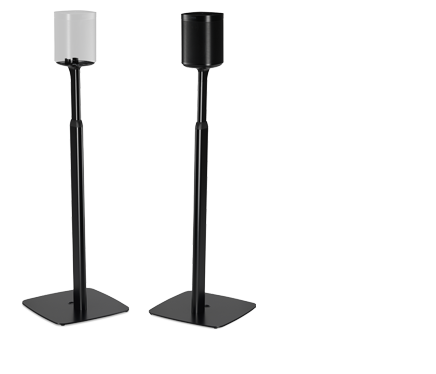 Amplify your brand, engage your customers & transform your business with CANOPY, the next generation music platform designed for your sound, space, and style. Classical Archives (ClassicalArchives.com) brings the largest collection of classical music recordings in the world to Sonos! This service presents close to 1.5 million tracks (90,000 albums) by 18,000 composers and 70,000 performers. Classical Archives is proud of the care and expertise with which our inventory is categorized. Our musicologists and computer scientists have developed a unique Contextual Metadata Engine which compares all incoming recordings to a canonical list of compositions. This allows all albums, works, movement titles, artists and composer names to be displayed and cross-linked with the care and accuracy classical music lovers expect. Unlimited streaming access is less than $8/month (or, better: $80/year). Listen to your favorite radio shows and stations whenever and wherever you want, thanks to DAR.fm on Sonos. Simply browse or search to find what interests you—sports, news, talk, and music—and DAR.fm will record and store them for you. Now you can tune in to virtually unlimited radio content in any room of the house—based on your schedule, not the station’s. Pause, rewind or fast forward to get to the good stuff. Free service. Available everywhere in English only. FIT Radio Workout Music: The only fitness app that provides you with non-stop, high energy music of all genres designed to motivate your workout. Dubbed the "Pandora for gym rats" by Mashable with features in SELF Magazine, Cosmopolitan, Forbes, Women's Running, Health, P90x and more. Focus@Will: SUPERCHARGE YOUR BRAIN! Reduce distractions while you work and study with this scientifically proven music streaming service. Multiple channels individually customized for your brain type, maximizing your cognitive performance. Almost a million users agree: If you want to get serious about dealing with distractions, nothing compares to Focus@Will. 14 DAY, FREE, NO RISK TRIAL. Listen to latest music albums, top charts, your favorites & playlists and much more, anytime. Just subscribe to Gaana+ service and instantly stream your favorite music to any Sonos system in your house with Gaana. Listen live to any station across the Hit Network for Hits & Old School. Featuring your favorite shows like Hamish & Andy, Carrie & Tommy and Ash London Live! Hotelradio.fm™ is a Premium radio service targeted at the hospitality industry. With over 50 music stations to help set the mood there’s a multitude of station choices available to define an atmosphere, be it in a restaurant, hotel lounge or spa or even at home! Curated by professional DJ’s, hotelradio.fm’s music programming gives you the desired music mix, when and where you need it and also offers the chance of individually programmed music channels for the ultimate customisation service. Since 2005, the Hype Machine's mission has been to help you fall in love with something new. We think the best way to find new music is just to listen to lots and lots of music—all kinds of it. That's why we don't use algorithms and we don't try to predict what you'll like—all we do is track hundreds of music blogs around the world. We present their posts in a single stream for convenient listening and easy discovery, and we let you find your favorites. It's free-form radio where bloggers are the djs. Their passion for music is your shortcut to hearing the next great thing, months before everyone else catches up. Start on the Latest Tracks channel—the newest music just hitting our site. Our community of over 1 million users favorite the tracks they like here, bubbling them up to Popular Tracks. You can heart tracks to My Favorites directly from your Sonos and join in. Explore the blogs in our listings at hypem.com, and subscribe to their posts to create My Feed, a stream of music customized just for you. Connect with your friends via Facebook and Twitter, and add their favorites to your Feed. Or listen to your favorite blogs via the Blog Directory—all posts from a blog, in a single playlist. There's a lot of music in here. Dive in. You can now offer your customers licensed, selective, non-repetitive, business and family-oriented music at your business with Jukeboxy Music for Business. With your LivePhish+ subscription, unlock the entire LivePhish catalog. Stream professionally recorded multitrack mixes of every night of Phish Tour on demand minutes after each show ends, and dive into the Phish Archives. Music matters. Don’t just fill the void. Experience the value of design and the peace of mind that Mood provides. From hits-based programs with broad appeal to evocative retro sounds and unexpected niche genres, our business music solutions are licensed for commercial use and designed by experts who combine an incredible knowledge of music with a deep understanding of brands and consumer experience. Pair your Sonos system with Mood Mix, our exciting new StreamingPlus™ music solution designed specifically for small business. Enjoy online access to fully-licensed music, with the ability to personalize your soundtrack at the click of a button. No proprietary device required – just a broadband internet connection. Fire up nugs.net to listen to last night's show from your favorite bands. Come on board nugs.net's curated live music service to stream thousands of professionally recorded and officially released concerts. Listen to full shows on demand, make playlists of your favorite live tracks, read and post reviews, and save shows for offline playback. Sign up for a 7 Day Free Trial and subscribe for $12.99/month or $129.99/year for unlimited access to current and archive shows from your favorite bands' tours, including Pearl Jam, Bruce Springsteen, Dead & Company, Widespread Panic, Umphrey's McGee, Gov't Mule, moe., and more. With Plex for Sonos you can now browse and play your entire Plex music collection on any Sonos device, right from the Sonos app. Top quality radio broadcasting online with a unique system combining excellent Stress Relief Music and Relaxing Music with Natural Sounds. Radio.com lets you listen to your favorite Sports, Music, News Talk radio stations for free - anytime, anywhere. radio.net gives you access to more than 20,000 radio stations. 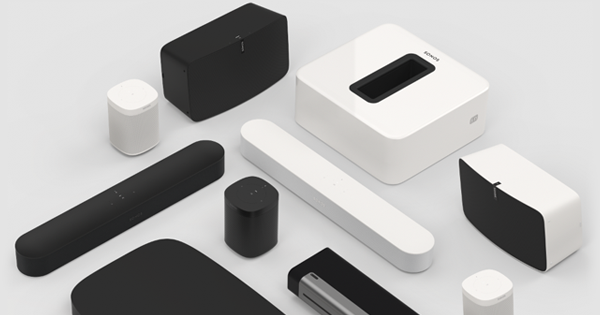 Experience your favorite stations with the best sound quality on your Sonos player. With Radio Javan, enjoy the best in Persian music with access to all the newest songs. Search for your favorite artists and music hits. Search for your favorite series, shows or stars. Create playlists to enjoy throughout the day. Simply choose a show from your favorite category, put your feet up, and be transported back in time to a world when radio ruled the airwaves, and when good clean entertainment enthralled the nation. Business never sounded this good! Whether an office or a restaurant, a retailer or a hotel, background music enhances both the customer and the employee experience. Hundreds of stations and millions of songs - including the ability to create artist stations - so you can design the perfect sound for your brand. Fully licensed for business environments. Listen to radio shows, podcasts, talk, news and sports on Spreaker. Spreaker connects you with the voices of people from all over the World: hear their stories live, or listen later as podcasts. Tens of thousands of shows available in every room of your home. Free Service. Curate your own personalized list of podcasts and tune in to the most up-to-date content in business, sports, politics, and entertainment from brands like NPR, CNN, BBC, Adam Carolla and more. Pull together your favorites from over 5000 podcasts, radio shows and stations to create a custom playlist, or allow Stitcher to recommend shows based on past listening. Stream it throughout your house on-demand. Free service. Being different – a fine selection of modern music from emerging artists in your shop, store, restaurant, gym, etc. WEYV unifies your digital entertainment by allowing you to easily listen, read and share content in one app.